What Day Of The Week Is July 15? 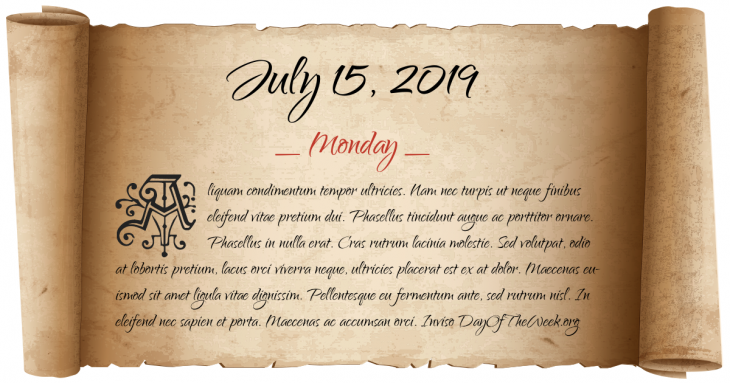 July 15, 2019 is the 196th day of the year 2019 in the Gregorian calendar. There are 169 days remaining until the end of the year. The day of the week is Monday. A fire destroys the ancient Basilica of Saint Paul Outside the Walls in Rome. Ralph Waldo Emerson delivers the Divinity School Address at Harvard Divinity School, discounting Biblical miracles and declaring Jesus a great man, but not God. The Protestant community reacts with outrage. Reconstruction era of the United States: Georgia becomes the last of the former Confederate states to be readmitted to the Union. The steel strike of 1959 begins, leading to significant importation of foreign steel for the first time in United States history. A terrorist attack is launched by Armenian militant organisation ASALA at the Paris-Orly Airport in Paris; it leaves 8 people dead and 55 injured. The Nintendo Entertainment System, the best-selling game console of its time, is released in Japan. Caspian Airlines Flight 7908 crashes in northwestern Iran, killing all 153 aboard. Who were born on July 15?